Who said we still need to wait for Expendables 3 before we can watch some cool, old dogs trash out the wide screen for us? Though it is quite a lesser known movie, Grudge Match makes up for it with two of some of biggest old school actors: Robert De Niro & Sylvester Stallone. What's so great about this movie, as implied by the trailer, is that it's not pure brawl but with a mixture of hilarity and fun moments. 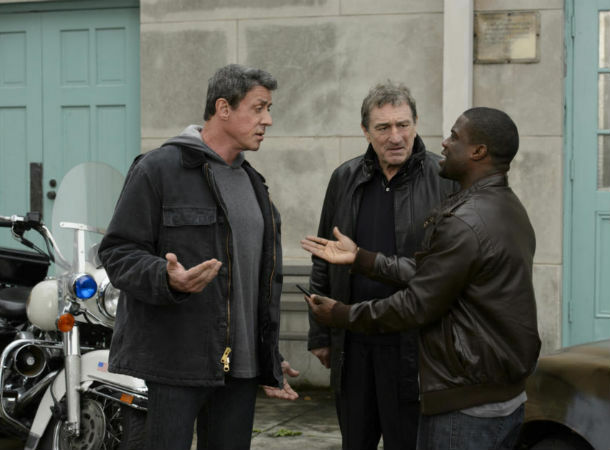 I seldom see Stallone in this kind of movie, but De Niro will surely make him catch up for that. Watch Robert De Niro & Sylvester Stallone do some IMBA fight (no offense to Mr. Robert De Niro, but that was how the trailer was edited) in the new Grudge Match trailer. The story revolves around retired boxers Billy "The Kid" McDonnen and Henry "Razor" Sharp, lifelong bitter rivals who are coaxed out of retirement and into the ring for one final grudge match -- 50 years after their last title fight. Lighten up your Christmas Day with this heavy wight movie as Grudge Match will hit theaters on December 25, 2013.